Here are the other CiM limited editions I tested at the weekend. Greeeeeen! Not a Kermit green though, a light blue-tinged green. I made a gremlin! 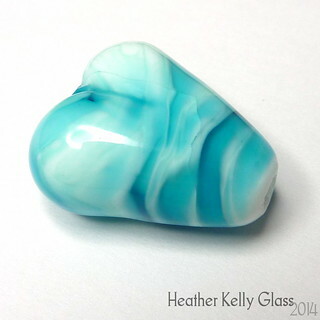 (Over a core of clear). Marine behaved fine thus far making the little hearts on top of this green. 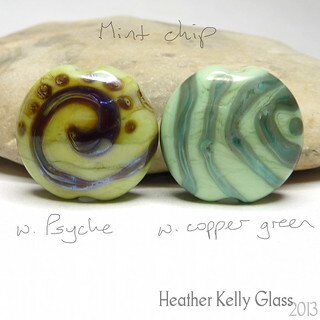 Here’s a comparison between It Ain’t Easy Being and Mint Chip, which was in the last lot of limited editions. The new green is a bluer one. Flax is a very pale yellow transparent. I did the heart to see if it did the faux boro effect with iris gold frit, like Effetre straw yellow. No! Ah well, bit of a fugly heart as a result. (The little hearts have marine or green lantern over It Ain’t Easy Being). These are another pair in the beige range. Hazelnut mousse is on the left here. It strikes a little, as visible on one of the spacers, and is a warm beige. 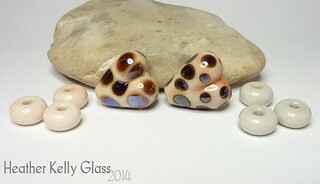 The heart with Double Helix psyche dots has gone a darker brown, as you would expect. Jupiter storm is the interesting one. It starts as a grey beige and strikes to an orangey colour. 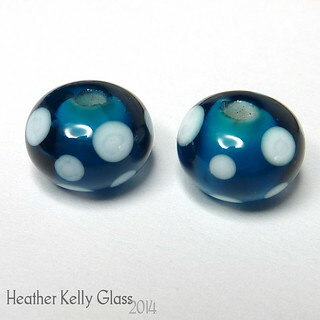 Good for silver glass – the psyche dots are sharp and have little outlines. Unusually, it hasn’t fumed from the silver glass – the orange is from striking. 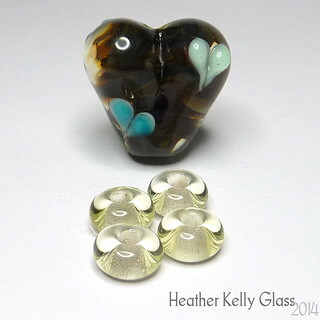 I made a gremlin too – this angle is to show that the psyche heart is right next to a more unstruck part that is still grey – no colour change from being next to the silver glass. Gremlin! I like this colour – it works like Effetre tongue pink, but is sufficiently different. Tongue pink is white when unstruck, not greyish, and it strikes to a less orange hue than jupiter storm does. Tongue pink also fumes much more. More to come next time – I have a fair few reds and oranges to test too. Lauscha sent me two new batches of reds to test. We have SNT 220 (07/02/13 batch) and SNT 219 (11/02/13 batch). I also have an older batch of SNT 220 that I included for comparison. Here’s a nice labelled picture of them all. 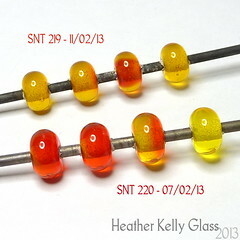 You can see that both new batches are fairly similar at a glance, and both are oranger and more transparent than the darker, tending-to-translucent old SNT 220. 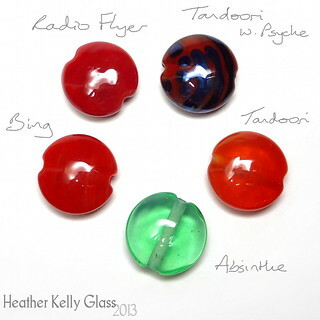 (I do very much like the old batch – it is similar to CiM maraschino in that it is semi-opaque when used thickly, giving a lovely depth of colour). 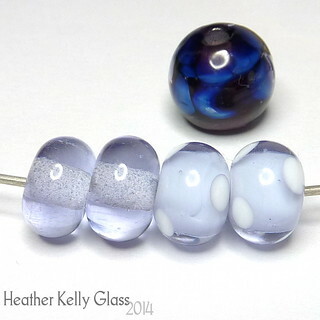 I’ll go over each type of bead side-by-side now. First we have the spacers. I did not attempt any deliberate striking of these as I wanted to see whether they were auto-striking or needed a little more effort. 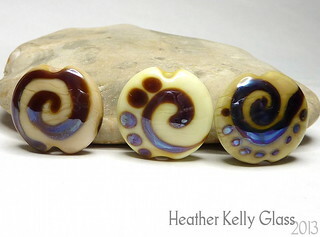 So I just made four spacers on each mandrel and put them in the kiln. 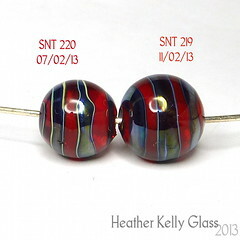 I was surprised how unstruck the SNT 219 ones came out, because they appeared darker when I put them in the kiln. Verdict: unlike the old SNT 220, they definitely need to be deliberately struck. 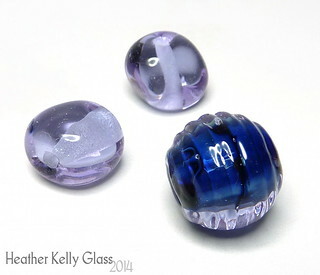 From the later beads, they don’t seem difficult to strike, but for spacers the attention needs to be paid. 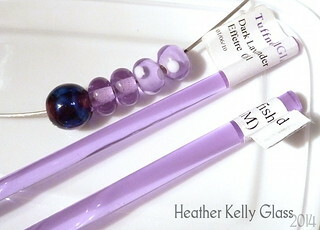 These two beads were rounded off in a bead roller and have a wrap of Double Helix psyche, heavily reduced. (Excuse the iffy end!) This was the darkest red I got out of either colour. 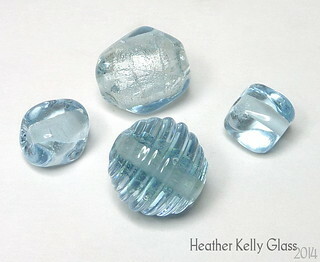 Both base beads are still transparent, though – you can see into them. The difference in outlines round the psyche is may just be due to the way it was melted in, rather than the base – it’s difficult to tell without further testing. 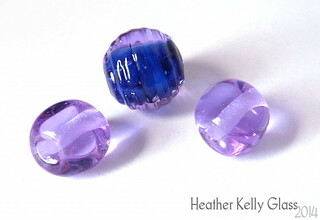 These two little beads show how they stand up to being layered. I used Effetre white to make stacked dots. 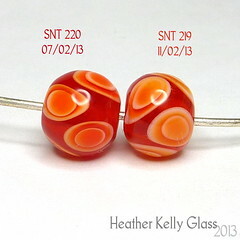 The new SNT 220 came out darker than the SNT 219, which is very orange in the dots. Both had a tendency to unstrike between layers – the SNT 219 was trickier to stay struck at the end. 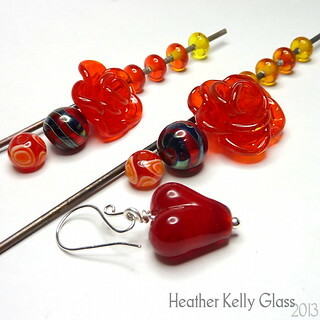 Finally, I made a pair of sculptural roses to see how they behaved when repeatedly heated and cooled, since these go in and out of the flame repeatedly as I add each petal. 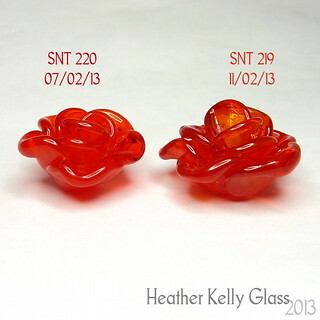 Both roses remained mostly transparent – the SNT 220 has a little cloudiness whereas the SNT 219 is almost perfectly transparent. The SNT 219 has stayed a little less struck in the centre and at the outer edges of some petals, which is a lovely effect in this kind of bead. Both are still orange-tinted reds. Both of these are very nice reds. There was no tendency to go brown in either of them. I’d probably pick one rather than both as they’re quite similar, it’s just tricky to choose which one! The 219 is lovely as a rose while the 220 is better in dots and probably marginally easier to strike. 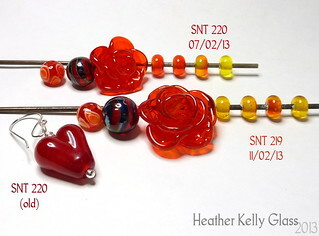 For further testing, I plan to make the same beads with my old SNT 220, and to make a plain lentil bead in all three of the reds. I may make a heart in the two new reds too. CiM have some more colours out: here’s my test results of a pair of rather nice neutrals. Cardamom is a pale pastel green and linen is an opaque creamy beige. The closest colour I have so far to cardamom is Effetre grasshopper green, shown on the left as a comparison. It is darker. 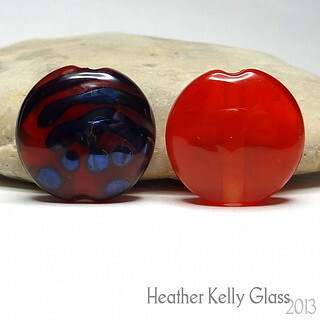 I etched one of each pair of these spacers. I decided to test cardamom against grasshopper green in terms of reactions. Many greens get a dark reaction line with yellows and reds: grasshopper green actually doesn’t. The colours I used for the dots are: Effetre bright acid yellow, CiM creamsicle, Effetre light red, coral and light sky blue. You can see that only light sky blue reacted with grasshopper green, and none of them reacted with cardamom. Cardamom’s also a very nice uniform green – no streaks, and the colour dots sit very cleanly on it. There’s a bit of fuzziness around the edges of the light red on grasshopper, and the yellows and coral have slight rings in the centre on it, making them look a little untidy. Here are linen and cardamom together. 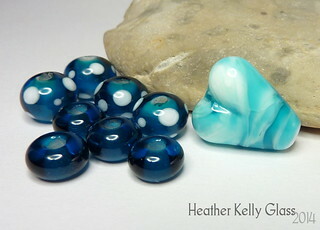 This side of the bead has copper green stringer. 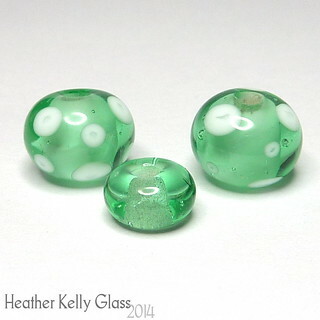 This is the same bead as the one below, so the copper green probably developed slightly more grey reduction than it normally would, despite my best efforts to only reduce one side. The copper green is showing some of its haloing effect and both linen and cardamom show some streaks under it. 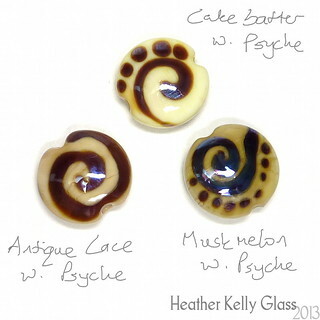 The other side of the bead has psyche stringer. The psyche has reduced better on top of linen: more purples and less brown. The silver glass has made the linen darken and the cardamom go yellower. There are some separation lines on both colours echoing the stringer lines, but they appear much cleaner than with the copper green. 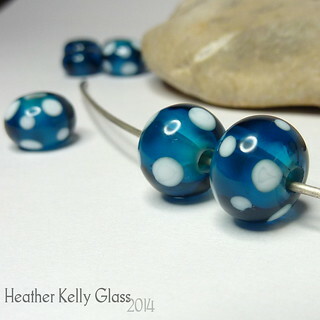 I wouldn’t really choose to use cardamom with silver glass based on this, but I love how clean it is with the dots above. One to appreciate for itself! I did some testing of Lauscha SNO 630 caramello recently. It’s a creamy, caramelly warm beige that looks good with reduced silver leaf. 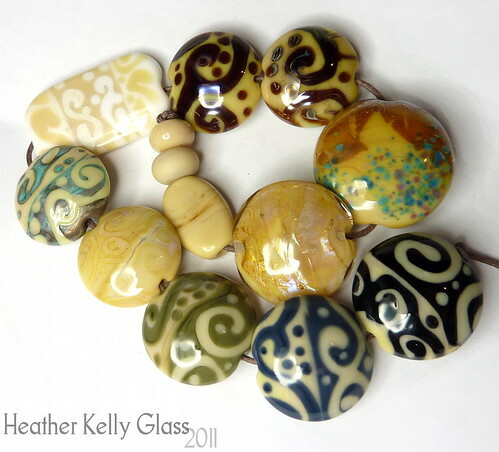 It’s also really nice to use instead of white in black-and-white scrollwork beads, for a warmer but still crisp and elegant look. You can see the full results here: Caramello Testing on Lauscha.co.uk.